Here it is. The last meal before heading off to SFO. After nearly 4 days of endless eating, it has come down to Katana-Ya Ramen. We really wanted to try this since the first night; but late night eats never came to fruition. Chalk it up to being too full. Or maybe we are collectively just getting too old. Sleep over eating? What has this world come to??? Honestly, I wasn't even aware of this place until we noticed a fairly large lineup every night as we walked back to our hotel. Generally, when there is a long lineup, it is either very good, has big portions or both. The fact that we heard people speaking Japanese in the lineup made it extra attractive. Despite a rich breakfast at Brenda's Soul Food and then lunch at L'Osteria, I met up with Kim at Katana-Ya for a second lunch or extremely early dinner. At first, it was only me in the lineup. I had put my name on the list hoping he'd arrive by the time a table opened up. No dice, 2 people had already been seated and Kim hadn't arrived yet. Out of pure luck, as I saw him strolling up the block, the only window seat in the whole restaurant became available. Score! Natural light for our photos! Right there, I had a premature “foodgasm”. Yah, and we hadn't even eaten yet! As I calmed down, we quickly figured out what to eat and ended up starting with the Mixed Seafood Salad. 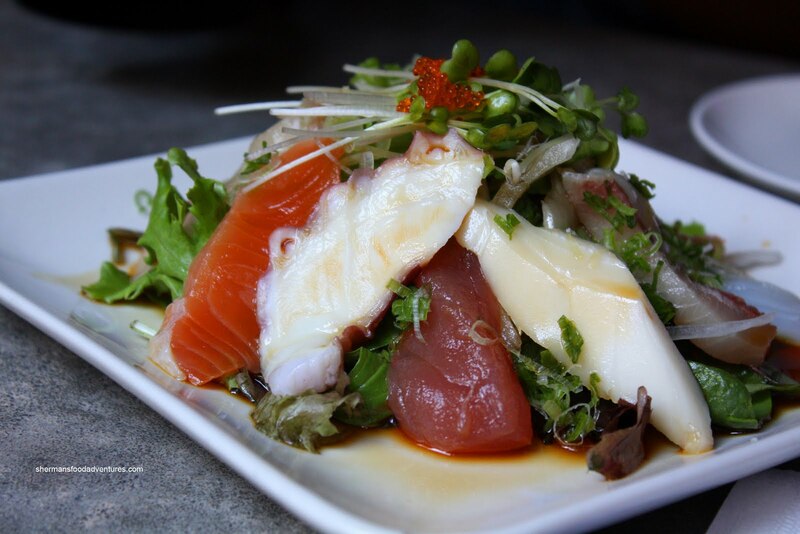 A selection of tuna, salmon, black cod, hamachi, tai, tako, ika and ebi atop spring mix and onions, this was a nice looking salad for the price. Other than the salmon and tai (which were fishy and texturally strange), the seafood was what it was supposed to be. The dressing was a bit heavy on the shoyu; but went well with the components nonetheless. 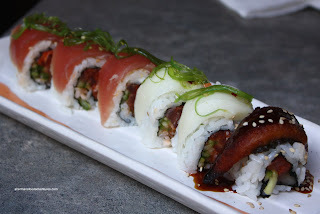 We also decided to try out the Hawaiian Roll consisting of tuna, salmon, butterfish and unagi. The rice was slightly on the gum mier side while exhibiting some vinegar hits. Not great; but not bad either. The components were fresh resulting in a satisfying roll. 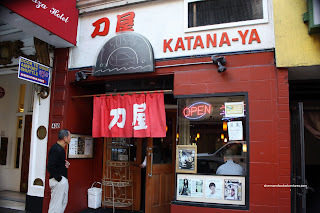 Of course we could not eat here without giving the Ramen a shot, so we got the most expensive one being the Katana-Ya Ramen. There was a lot going on with this bowl of ramen, it included pork, fried gyoza, chicken karaage, corn, wakame and egg. 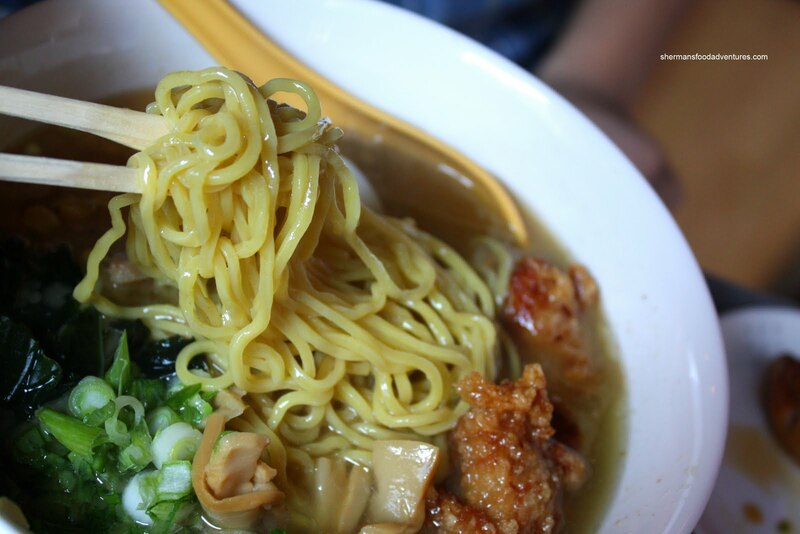 We went for the rich shio broth and it was indeed heavy, especially on the fat. It wasn't exactly full of depth; yet it was flavourful enough without being too salty. The noodles were slightly chewy; however, we would've liked to see more “snap”. 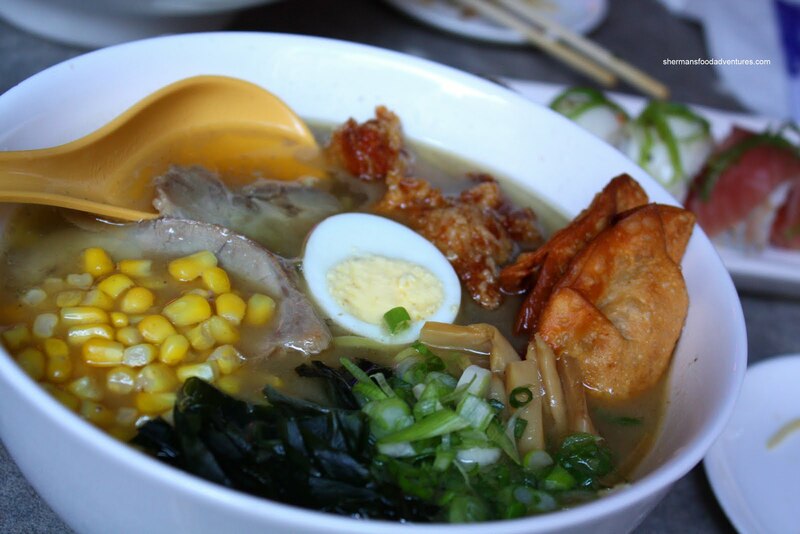 All-in-all, a very decent ramen. With that being said, we agreed that Hokkaido Ramen Santuoka is better for the same price. 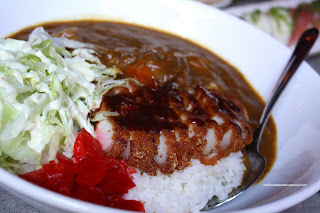 Just for kicks, we added the Curry Katsu. Wow, when it arrived, we were taken aback at the portion size. More than enough for one person. Unlike some other Japanese curries I've had, this one was more spicy and curry-like. In fact, it exhibited much less sweetness that is typical of Japanese curries. Personally, I liked the thick spicy curry. Lots of carrots and potatoes along with a large, perfectly fried pork cutlet. The rice itself was not bad exhibiting some chewiness. Well done, I'd order this again. My goodness, 3 meals within 4 hours of each other. Oh well, at least I did a lot of walking. Was the Ramen worth lining up for? For me, if the lineup is short, sure. If it was crazy long, then maybe not. Bottom line is that all we ordered was solid and well- portioned. Nothing wrong with that.